Time stands still for none! I felt it was only yesterday I announced an event to celebrate my blog’s third birthday and days just flew. It was also a right moment for me to get another Mela going. This being the summer, Thanda Mela was really apt. And a mela it has been, a gallery of cool, cool dishes coming our way! I got about 120 entries, some blogges sending more than 10 entries. Thank you everybody! Lets check out some fruit juices first! Denny was in search for the Pomegranate, which unfortunately were not in season. Finally found the perfect solution for the quest by making this Pomgranita which sure is a great healing drink! Jyothi makes this Watermelon Crush to handle the heat. Prani makes Tropical Juice to enjoy in the hot climate! Premalatha makes this simple juice with Apple Aloevera for a refreshing feel. I don’t actually remember the first time I had Lassi, but I only remember that I have forever fallen in love with the taste. Imagine being introduced to the fruit based. Come mango season, you will find me making this one too many times. Lets see the different ways our entries have come. Very innocently I asked my fellow bloggers on Facebook on their choice of lassis, bang comes back Aru with a sinful Strawberry Lassi ‘cos she had a basketful of strawberries lying with her..read on her story to see how she made it! Followed by Jyothi, who true to call sent us three different versions for all, a Rose Lassi, a Mango Lassi and if not enough a Sweet lassi for others! I am sure none of us will ever complain for lack of lassis, will we? If there was one thing that captivates all, I am sure it is Ice creams. The varieties that have come our way surely pays ode to it. Simply.food tries her hand at making a favorite childhood fantasy by making milk ice at home, but this Saffron~Cardamom icecream looks more divine than what I remember! To beat the hot days Soma makes this beautiful Strawberry Sorbet. Her picture says all! Then we move to relish some delicious milkshakes. 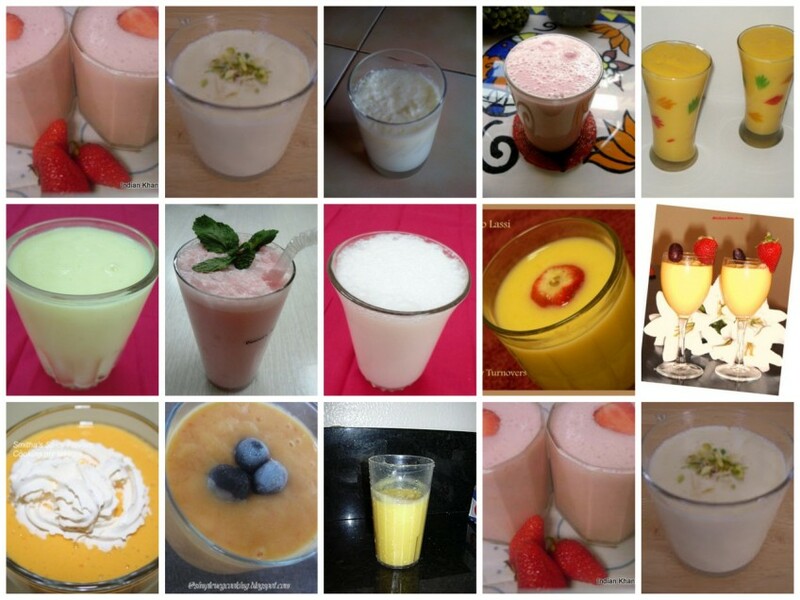 Bharathy dones her creative cap to send us a inviting Papaya Milk Shake. Being a papaya hater, this turned her to love this! Wanting to make some ice creams Champa ended up with a shake a Chikkoo Milk Shake, no worries we love shakes too! If left over carrots is what you have, then I am sure Sangeetha’s Carrot coconut almond milk is just right! Sayantani makes this wonderful treat for an afternoon and is determined to repeat all through the summer. I am sure her family feels elated hearing that! Thandai for a day, keeps the sultry day aay! Not wanting to crib on the raging heat, Arundati makes a Lemon and mint iced tea and beats the heat right back! After getting hooked to the iced Tea served at restuarnat Brinda recreates a Citrusy Refreshing Iced Tea at home! Having always loved making Tiramisu, Priyadarshini is happy finding a quicker yet tastier recipe. 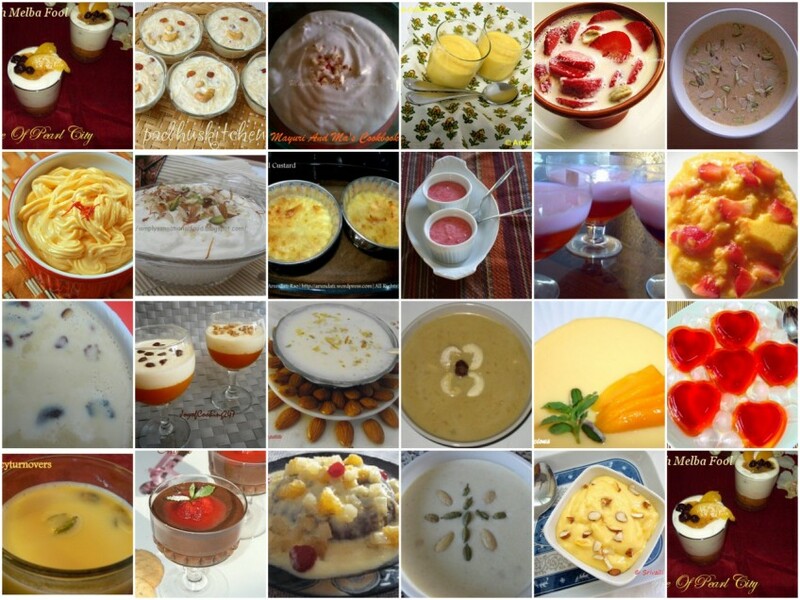 If you are looking for a quick dessert which is also very colourful, then Richa has the perfect one with Fruit Cream. Next on the display are puddings, Mousse, Kheers..
Apu feeling deprived of a mango mania in england makes do with a canned tin for making this delightful Mango Cardamom Cream. Aru’s childhood memories are full of Caramel Custard, which her mom used to make often. So she had to make them again! Champa during her non blogging days found a recipe for mousse that works out perfect. So it’s only natuaral she wants to share! Her Strawberry Mousse is one sure way of getting your kids eat fruits! Harini-Jaya makes a Pesarapappu Payasam and a long awaited dish Mango Mousse, which she always wanted to make herself. Jagruti loves watching a particular TV show, where most end up making a panna cotta. Finally one day she decided enough was enough and attempted making a delicious Mango Panna Cotta, vegetraian way! Jay makes this quick Badam Payasam and says it was so easy to make which can be whip for the many festivals we have. Jyoti loves Gaajar Kheer and is happy that she is the only one who loves this so much at home. Lissie celebrates her blog anniversary with a special Christmas Pudding. How wonderful it is to know that, lets wish her many more years too! Mayuri loves starting her day with a dose of this yummy Shrikhand with rotis, now who won’t tell me! Madhurya Karthik sends us two wonderful kheers, a Badam Kheer & Dhal kheer. Then we have Padhu making this Vermicelli Kheer for her daughter’s friends, who thoroughly enjoyed the treat! Another panna cotta coming our way, this time it is Pari who makes this Mango Panna Cotta as it was something she was planning for a while. While Priya Suresh makes a Strawberry Kheer in Microwave! We have another microwave dish this time from PJ who makes Pumpkin kheer and feels happy that she used fat free milk! Shabs has a passion for Dark Chocolate Mousse so she makes it again in a different way! Jyoti Babel had this Apple celery and pineapple Salad first time in a resturant and has been hooked to it ever since! While Priya Suresh makes Quinoa & Mixed Fruits Salad on everybody’s demand for salad! 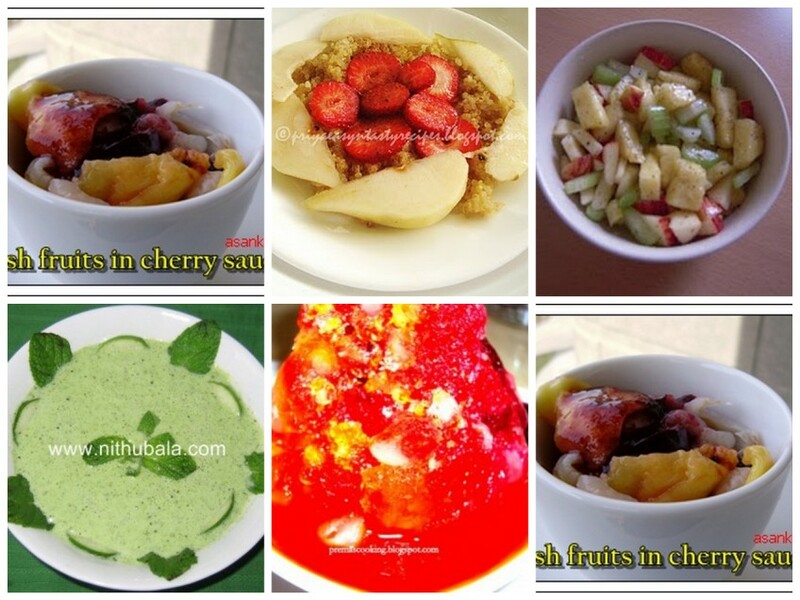 And lastly we have Priyanka making a bowl of salad with fresh fruits in cherry sauce. We have some tempting Smoothies coming our way. Ask me what Priya Suresh hasn’t made, and I won’t seriously have an answer! Her Jackfruit Smoothie, goes just to prove that! 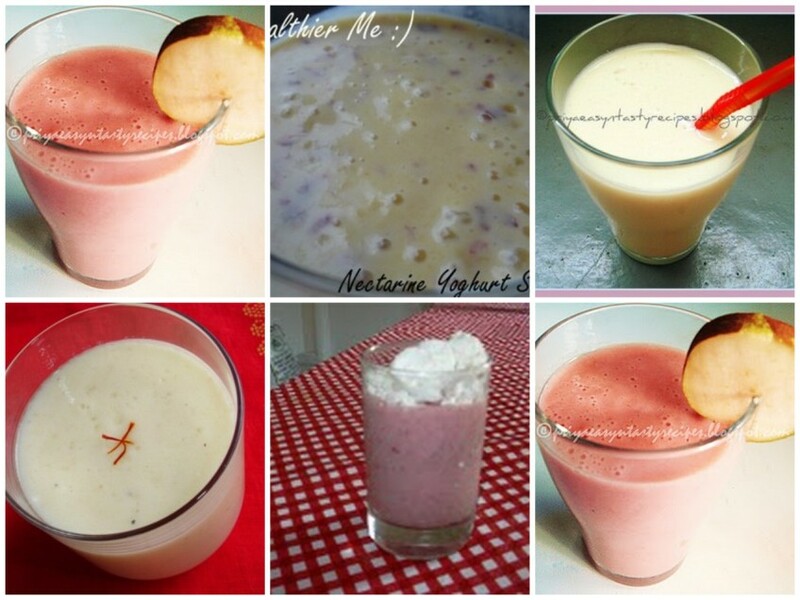 And another in the list is her Strawberry & Pear Smoothie. 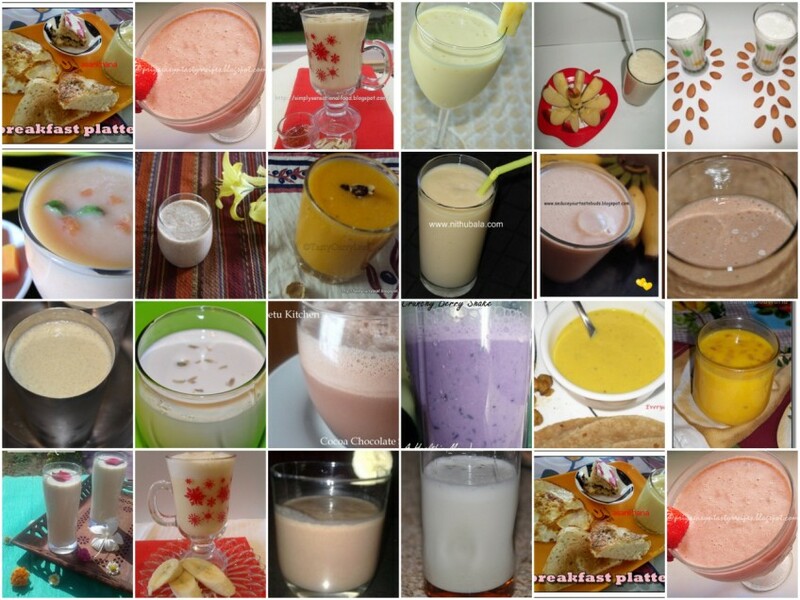 For her work out vratham, Suma makes this Pear Smoothie to get the schedule going! Finally from Vidhya a Strawberry Smoothie. Then we move on to enjoy some salty and traditional thandas from our bloggers. First on the list is the Kadhi which is a sour-n-sweet dish made from buttermilk sent by Anamika. Not to be left out, we have an Avocado Buttermilk from Panchpakwan. Matha is yet another spicy buttermilk from Priyanka. 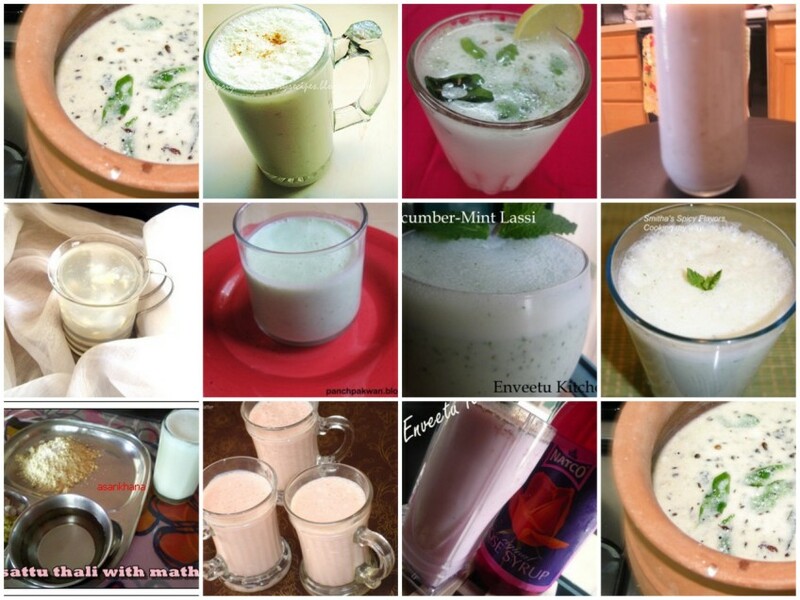 While Smitha makes a Khara Lassi as this is their family’s favorite one! Finally we have Suma Gandlur sending us a real new one, atleast I have never heard of it. She makes a Nannari Lassi with the Nannari roots. How Fab! I am sure everybody enjoyed this Thanda Mela as much as I did! My apologies if I have missed out any entry. Please let me know I will update right away. The Mega Rice Mela Round up ~ Part 5! Announcing the “Best of year 2014” Event! Thanda roundup Valli! Great job putting it together. Nice round up. Lot of recipes to try. 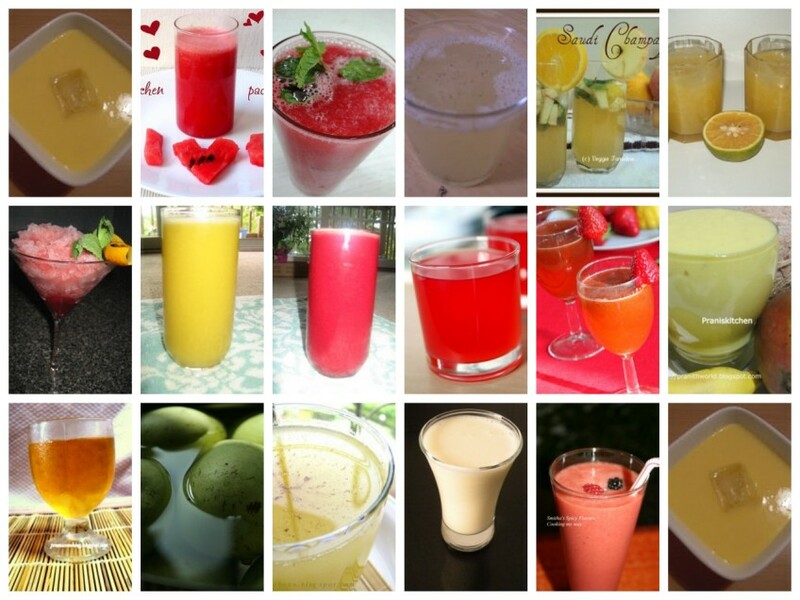 Wat a beautiful roundup Srivalli, fabulous summer treats, definitely a treasure..
wow.. great collections.. yummy recipes..
All the drinks look so colorful and pretty.. what a dazzling array of creativity! A great collection of summer coolers to be preserved for future reference. Thanks for composing and sharing all this with us. As always "You Rock Srivalli"
Valli, thanks for ur roundup. Its really beautiful and colorful too. congrats to all participants.. will bookmark this post and forward to my friends.. 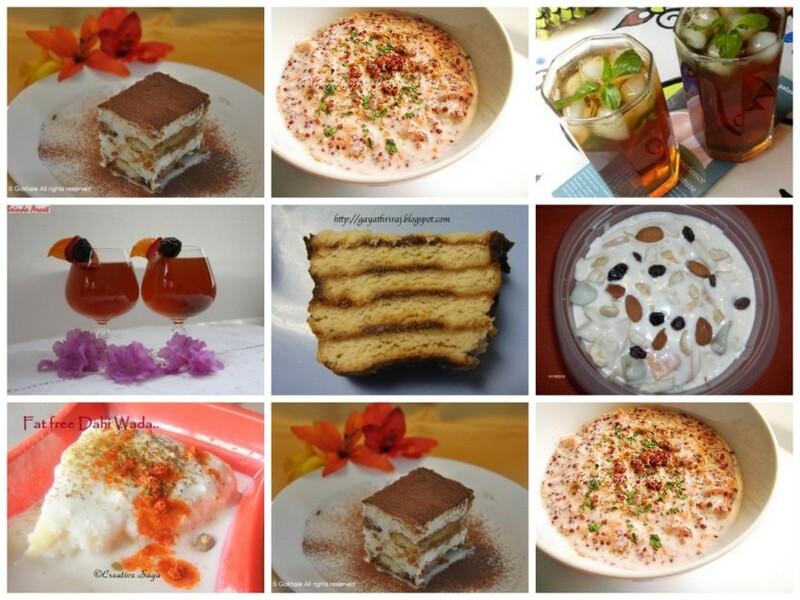 Perfect round up to welcome the summer… that is an amazing amount of recipes out there! cool… roundup Valli great jod what is the next mela really i missed this mela and also ICC..
Great round up, Valli! 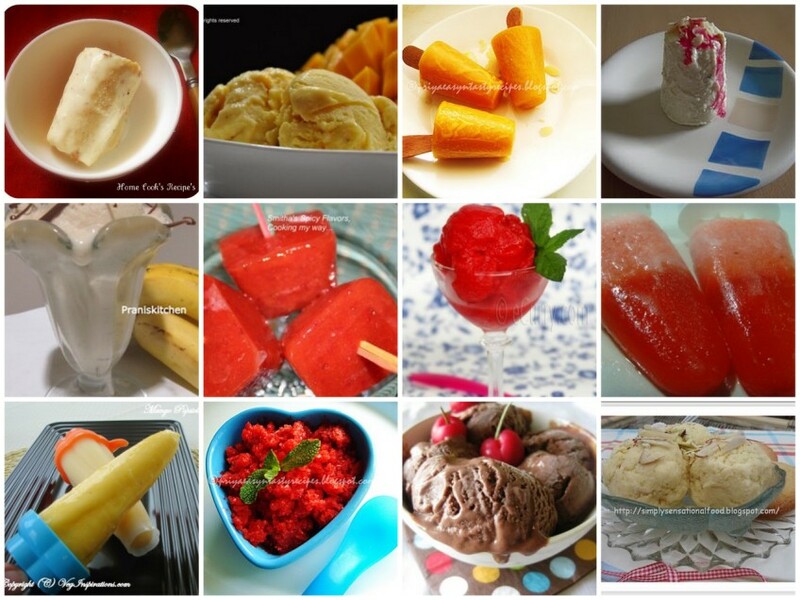 A collection of very good thanda recipes!!! Wooooowwwwwww…. I have got enough to chill this summer…so many things to try out..all this season..Thanks ! Wow ..everything looks so cool and colourful! Wow Valli, Super Jill Roundup!!! That's quite a mela! I want to try every recipe!